Two weeks ago, we announced our November Gobbler Gaming Giveaway (NGGG), a month long contest that includes four (4) NVIDIA Tegra 2 powered tablets and a couple of gaming-inspired prize packs. Each week, we have handed out a different tablet, with the prize packs (Jamboxes and $25 gift cards) being tacked on during this giveaway and the last one. Up first was the Samsung Galaxy Tab 10.1 followed by the Asus Transformer last week. So far we have seen an intense amount of participation, but this week was even crazier thanks to the added prize pack. 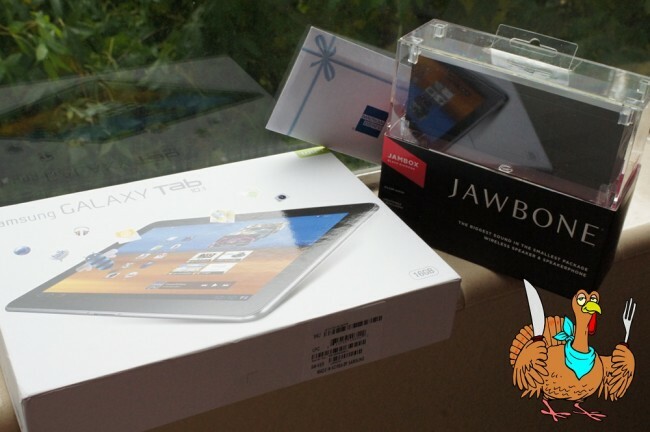 Not only is our winner going to receive a Galaxy Tab 10.1, but some cash and an incredible mobile speaker to go with it. TimB who loves Gears of War 1, Gears of War 3, and Zelda: A Link to the Past. Congrats on winning the new tablet, Jambox speaker and cash! To everyone else, tune back in Monday morning for your chance to win the last tablet provided by @NVIDIATegra and the Tegra Zone. Next week’s giveaway will also include the same prize pack that we had this week – a Jambox speaker and $25 gift card.